I saw the opening night performance on Wednesday, which was fun but a little surreal for me personally, not because of anything that actually happened in the performance, but because of my history with the characters and the world of the play (or at least, the world as I had imagined it). My work in the publications department at A.C.T. lends itself to a very strange and wonderful distance from the work that happens onstage. Because of our print deadlines, we generally finish our work on any given play about a month before the live show opens. For Souvenir, in early January I had a brief and captivating relationship with the mysteries behind the characters in this show when I was assigned to write accurate profiles for the real-life Florence Foster Jenkins and Cosme McMoon. I found myself, in an attempt to uncover the facts about these people who had a brief brush with fame 60 years ago, fairly close to crossing the line into investigative reporting (or so I keep telling myself). A hard-hitting journalist, if you will, digging deep, uncovering the lost treasures of a time and place that existed before the internet (inconceivable!). 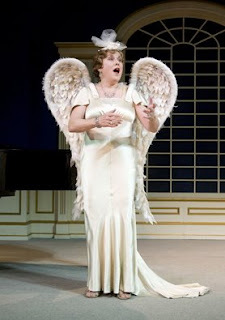 What I eventually discovered was that, though everyone seems to know about Florence Foster Jenkins, she has become, in the 60 years that have elapsed since her death, a somewhat mythical figure. She was never a real celebrity or even a notable musician of merit, but more a confection for the Manhattan elite, a comic gem among those in the know. As for poor Cosme, his entire identity had been all but erased by posterity, as most of my sources claimed “Cosme McMoon” was an alias for a rotating series of pianists who accompanied Mme Jenkins but were ashamed to be associated with her. Throughout this process, a surprising and random collection of sources came forward. I found an elderly journalist who, in his early 20s, had lunched with Mme Jenkins before one of her recitals (he told me she politely asked him to send her flowers for her curtain call). My investigative partner, A.C.T. Publications & Literary Associate Dan Rubin, developed a friendship with Florence Foster Jenkins’s one and only documentarian, Donald Collup, who led him to a grand-nephew of Cosme, Mark McMunn. Between these sources I was able to put the missing pieces together, as surprising revelations about both Mme Jenkins and Cosme were uncovered—including a photograph taken in the late 1970s of Cosme posing with a young, precelebrity Arnold Schwarzenegger (generously oiled and wearing nothing but a Speedo), to which, in a great tragedy of the publications department, we were unable to secure the reprint rights. But we also found this: Florence Foster Jenkins’s recording of The Queen of the Night’s famously treacherous aria from Mozart’s The Magic Flute. Not quite Judy Kaye, but sublime in another way, and complex enough to make me wonder if we’ll ever figure out who Mme Jenkins really was.